After driving through Cedar Creek Resort’s wooden gates, you’ll be welcomed to your quaint cabin by the lush green yard, breathtaking lake views, and cozy porch swing. Soak up the Midwestern sun and take advantage of Cedar Creek Resort’s many communal amenities. With a playground, picnic area, and everything in between, this expansive resort has everything necessary to enjoy the outdoors just a stone’s throw from your front door. There is free wi-fi available at the cabins, A-frame, Lodge and Conference Center. Lodging includes linens, bath towels, blow dryer, coffee pot, soap, shampoo, mini-kitchen, small selection of pots and pans, place settings for 4. All cabins, Lodge and homes are air conditioned and heated. There are televisions with DVD and VHS players in all cabins and homes. There is a free lending library of movies, inspirational material and books in the registration office. There is no maid service provided during the stay, but towels can be exchanged daily. -Amenities include a well-equipped kitchenette, free WiFi, TV (3 channels only), DVD/VHS player, paddleboat, dock/boat slip, on-site parking for 2 vehicles in the driveway, and much more! – Community amenities include picnic tables, a fire pit, a playground, paddle boat, dock/boat slip, conference center, and more! Bait a hook and catch some sun in the ‘Peaceful Potters Cabin.’ Nestled on Newman Lake, this 1-bedroom, 2-bath vacation rental cabin is the ideal getaway for groups of 8 looking to find some solitude against a backdrop of rolling hills. Sitting like ducks in a row, these 6 cabins are on this 167-acre resort surrounded by pastures filled with horses. Master Bedroom: Queen Bed | Loft: 1-2 Queen Beds | Living Room: 2 Sleeper Sofas or Futons. Contact us for more information regarding beds available in each cabin. 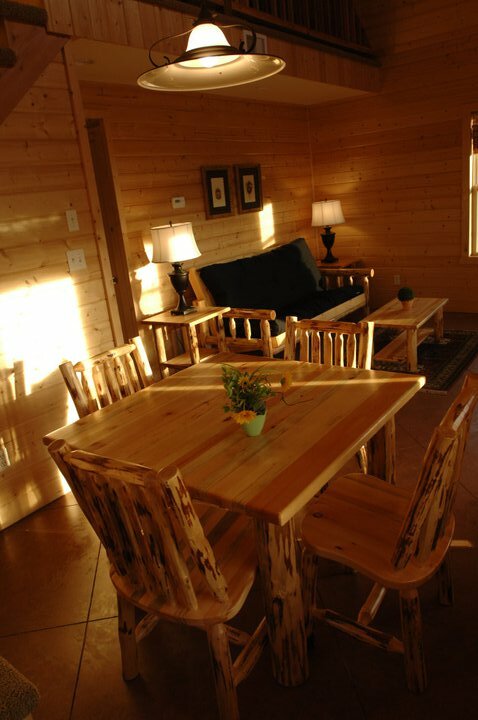 Upon your arrival at Cedar Creek Resort, take a seat on ‘Peaceful Potters Cabin’s’ porch swing and feel your stress vanish as you take in the cabin’s unbeatable lake views. Once inside, gather on the living room’s 2 couches and pop a DVD into the entertainment center and enjoy a movie with the family. When the credits have rolled and it’s time for dinner, whip up some dinner in the well-equipped galley kitchen complete with counterspace and lake views, before retiring to the cabin’s luxurious bedroom. You’re sure to drift effortlessly to sleep in the queen bed as you watch a movie on the flat-screen TV. The loft featuring at least one queen bed and a bathroom is the perfect hideaway for kids craving a break from their normal sleeping quarters. The A-Frame provides a larger living space for larger groups. Main area features an open floor plan with views to the beautiful lake from the living room. Enjoy the quiet A-Frame, tucked further back in the woods from the main cabins, with a private dock. The kids will absolutely love the bunkbeds in the loft and the upstairs view only accessible by ladder.